In a serious bid to extract even more performance and refinement from their excellent Lagonda, already one of the fastest and most refined four-door luxury saloons in the world, Aston Martin are in an advanced stage of development with a twin-turbocharged version. A power output close to that of the magnificent Vantage, but with even more torque and flexibility, is claimed, enough to boost this heavy, sporting "limousine" from 0-60 m.p.h. in under seven seconds and to 100 m.p.h. in 15 sec. If all goes according to plan the Turbo Lagonda should go on sale in about two years, at a price which will reflect continued inflation and the standard Lagonda's current price of £50,000. Recently, I was allowed to drive the only prototype around the roads of Bedfordshire, accompanied by Arthur Wilson, Aston's Deputy Chief Engineer. 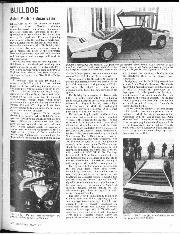 The turbo project has been masterminded by David Morgan, who succeeded Mike Loasby as Chief Engineer when the latter moved to De Lorean; Morgan was holidaying in Australia on this Lagonda occasion. The 5.3-litre, four overhead camshaft V8 of the standard Lagonda is in a "softer" state of tune than in its Aston Martin V8 application to give rather more gentlemanly characteristics of quietness, smoothness and flexibility. It would have been easy to extract more power by attaching a Vantage engine to the standard equipment, Chrysler Torqueflite automatic transmission, but to the detriment of the Lagonda's intended character. 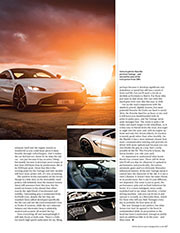 Turbocharging seemed the logical alternative and Aston have worked with Garrett AiResearch to develop a suitable system. Two small Garrett T03 turbochargers, one per bank, were decided upon as giving better throttle response than a large, single turbocharger. As the broad V8 completely fills the engine bay laterally, the turbochargers were mounted forward of the engine in the long nose, each fed by a log exhaust manifold from its respective bank of four cylinders. Air is drawn into the compressors from a common filter mounted under the bonnet lid and the compressed air is fed into a cast aluminium plenum chamber — a standard item from the US emission engine — atop the four Weber 42DCNF carburetters. These are the normal Lagonda carburetters, suitably re-jetted. A single wastegate, made by Garrett, but mounted on an Aston Martin designed housing, is set to allow maximum boost pressure of 10 p.s.i. A pressure relief valve sensitive to manifold pressure — it incorporates a piston exposed to manifold pressure on one side and boost pressure on the other — allows the turbocharger to keep turning on the over-run instead of stalling as in most applications. The result is considerably improved response when the throttle is re-applied. In Lagonda specification, the Newport Pagnell V8 has milder camshaft timing and bigger valves than in the Aston Martin V8 application. These remain unchanged in the Turbo. In fact the only mechanical alteration is the fitment of 7.5:1 compression ratio Cosworth pistons. A full-flow, instead of by-pass, oil cooler system incorporates two larger coolers. A larger radiator is repositioned at an angle and cooling is helped by twin electric fans. Actual power output is claimed to be very similar to that of the Vantage, but at a lower engine speed. 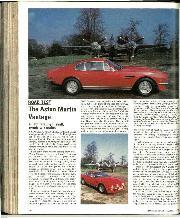 Faithful to the Aston Martin tradition, Arthur Wilson refused to divulge the actual b.h.p. 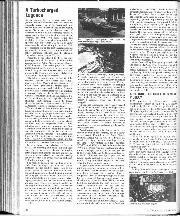 figure, but from what I gathered at the time of my Vantage road test (Motor Sport, April 1978) it is likely to be a shade over 400 b.h.p. Wilson was more forthcoming about torque, which peaks at just short of a colossal 500 ft. lb. between 3,200 and 3,500 r.p.m. and is over 450 ft. lb. all the way from 2,500 r.p.m. to 4,500 r.p.m., surely destined to be the largest torque figures of any production engine in the world when the Turbo comes to market. Magazine production pressures had prevented me from accepting an earlier invitation to drive the standard Lagonda, of which some twenty have now been delivered, so I cannot draw a comparison. 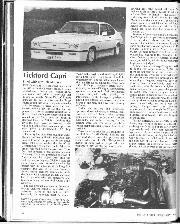 And the Turbo prototype had started life as a standard Lagonda development car, chassis no. 4, with which all the MIRA pavé work had been completed; the body structure had survived incredibly well, but the trim was incomplete and the side windows Perspex. Nor were the electronics complete, though the speedometer and tachometer were of digital type and most of the auxiliary switches of the much-vaunted, touch sensitive design. Prototype crudities or not, this Lagonda Turbo was astonishingly swift, smooth and refined, the turbocharger characteristics ideally matched to automatic transmission, of which the Torqueflite is one of the best. 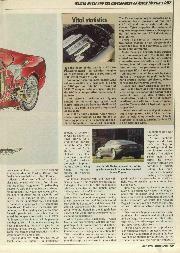 Boost showed up on this experimental car's gauge as low as 1,500 r.p.m., depending upon the torque loadings, and built up with smooth progression, this powerful British thoroughbred, once beyond 2,500 r.p.m. or so accelerating with such withering force that on one occasion we were able to leave an XJ-S gasping for breath. This was mighty power indeed, and open road performance was prodigious yet sludge-pumped subtle. The hard used engine — it had completed many hours of dynamometer testing as well as thousands of miles in the car — was a little clattery and the turbo whine penetrating at times, but that was to be expected without the normal under-bonnet sound-deadening. Maximum speed must be in the 150 m.p.h. plus region, yet this Lagonda was as docile as a kitten through the Bedfordshire villages. Throttle lag wasn't totally disguised, but minimal. Apart from adding Vantage alloy wheels and 255 section VR Pirelli tyres, Aston have found it unnecessary to modify the running gear. This is hardly surprising, because the ride, handling, roadholding, braking and power steering (via a tiny wheel) qualities are superior to any other large and heavy car I have experienced. The Lagonda's performance and chassis behaviour is close to racing car standards combined with the ride contfon and lack of driving effon of a Rolls-Royce. Some things still make one proud to be British. — C.R.